European entrepreneurs have a significant presence in Silicon Valley, and the general value of European startups is gaining more and more visibility in the Bay Area. As the European community here has grown stronger, organizations have formed with the specific focus to assist European startups looking to engage with Silicon Valley. Whether this means immersion programs and market validation, or coworking spaces and business development mentoring, bridge organizations provide enormous value not only to the startups they help, but to the overall effort to bring the European innovation ecosystem up to the level of the United States. The increasing value of innovation as a competitive factor not only for private organizations but also for the future of a country economy is a trend that we believe deserves a detailed study. 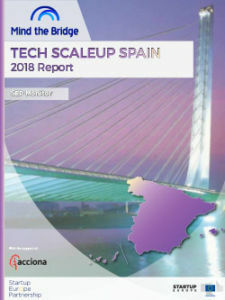 As such, our main purpose is to create the first report of what we call the “Economy of Innovation in Silicon Valley”, that is the aggregate effort of all the organizations that play a role in creating directly or indirectly technologically innovative products and services. To that end we want to focus specifically in all the entities in Silicon Valley that have a strong European link and are part of the innovation economy, namely startups, investors, corporate innovation outposts and all the bridge organizations (government related or private) that act as a bridge to support such entities between Silicon Valley and their respective European countries. As part of this ambitious goal, we have embarked in several areas of research to compile a more holistic view of the European Innovation Economy puzzle in Silicon Valley. Last September we started mapping the corporate innovation outposts in Silicon Valley through dedicated studies, as well as European scaleups that have moved their headquarters to Silicon Valley. The report we launch today is specifically focused on the subset of the so-called “Bridge Organizations”, that play a key role of support, aggregation and network. Our ultimate goal is to create a central directory for startups, corporates, investors, and governments interested to find information on the organizations which might help plan an approach or a presence in Silicon Valley. 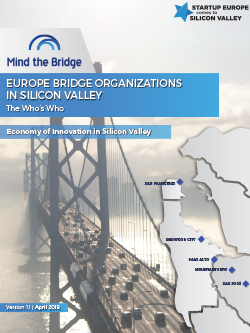 We define “European Entrepreneurship and Innovation Bridge Organizations” as organizations whose main focus is supporting startups of European origin while landing in Silicon Valley and promoting entrepreneurship in their country of origin by bridging to Silicon Valley. One or more EU countries or region must be the main focus. Beyond them, there are various organizations that – among other activities – might support startups and entrepreneur- ships. Examples are Trade Organizations and Business Networks as well as Consulates. The main definition criteria is to distinguish organizations whose *main* activity is in the support of startup/entrepreneurship (European Bridge Organizations) vs more generic bridging organizations. Sometime the distinction is blurred or the focus of the organization has shifted over time, so we do expect to come across “gray areas” in the above definitions. However, while the data can subject to change and updates, the following report is the result of several months of research and interviews, and we believe it provides a pretty accurate picture of the state of the art. Overall, we believe that one of the most relevant findings of this research is the confirmation that Innovation as an industry is playing a increasing role in countrywide economies and growth strategies. So much so that several innovation outposts of European countries in Silicon Valley have been used as the first foot-in-the-door, with plans to build overtime more structured and formal government representation to continue representing the economic interests of the European countries.